Of all the big moments in the year of a high school senior, nothing looms as large as prom. Joined-at-the-hip couples live for it. For the rest, the nervous energy of “Will I get asked?” “Who should I take?” and “Should I go at all?” nearly reverberates off school walls. But, years later, ask me what I recall about it and I got nothing. Nada. That’s where the 1978 diary and a dash of imagination come in handy. By Thursday, April 27, things were—along with the weather—heating up. The previous day some kid named Kurt walked up to me by the cafeteria snack bar and questioned why I didn’t ask Kim to the prom. “From what he told me,” the diary states, “she was waiting for me to ask her.” This was a surprise to me. Thursday also meant a tough track practice after school—“20 x 110s, 25 x 60 hill runs, weight and circuit training”—and junior pal and fellow middle-distance runner Theron Hollingsworth and I tried to laugh our way through it. “Grace under pressure,” he said, cribbing Hemingway from our 20th Century American Lit class. That night I brought my German trip slides over to Kim’s for a presentation to her entire family. After the show, around 11:30 p.m., we stepped outside and talked about prom. She confessed she couldn’t have gone anyway. The April breeze was sweet that night—“crickets were chirping outside my window, pretty warm out tonight,” the diary reports. Then—just like that—it was Prom Night, April 28, 1978. In school, Mike Gottschalk declared it “Hat Day,” so everyone found a crazy hat to wear; I walked around with a blue baseball cap and sunglasses on. I had track practice again after school, then stopped by Anthony’s Floral to pick up Sally’s corsage. I arrived at her place at 7:30, where we had pictures taken, then did a repeat performance for the Family Project (photo above left) before heading to Hazeltine National Golf Course in Chaska for the festivities. Standing in front of that living room fireplace, Sally and I are all smiles. But look closer. You’ll see an awkwardness we’re trying to tamp down. —Another freeze frame. Our view from the fireplace, toward the dining room. 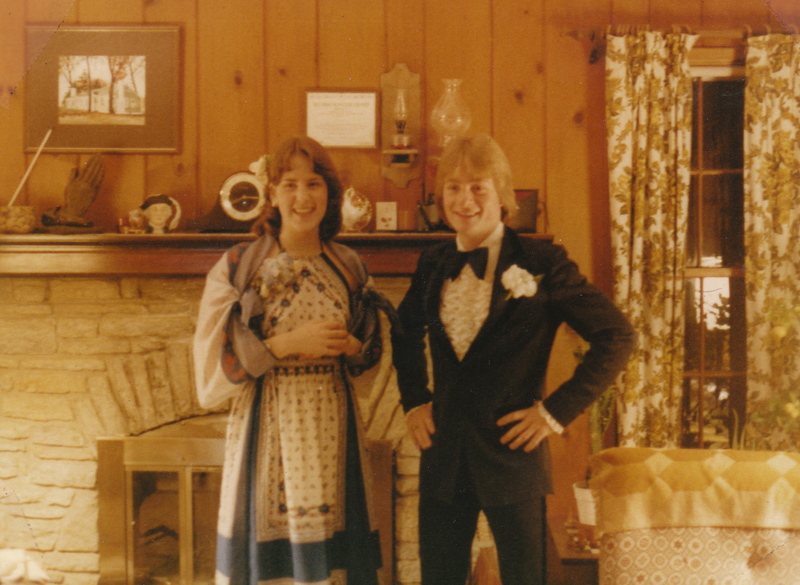 The photo at right bears with it a flood of memories: the warm wood paneling and rafter ceiling … it’s not from Prom Night, as the light isn’t the same. But the photo gives me a window into a part of that night I’ll never know, so let’s go there, okay? Let’s imagine Sally and I have already stood by the fireplace, pinned on corsages, had our photos taken, and headed out the door. 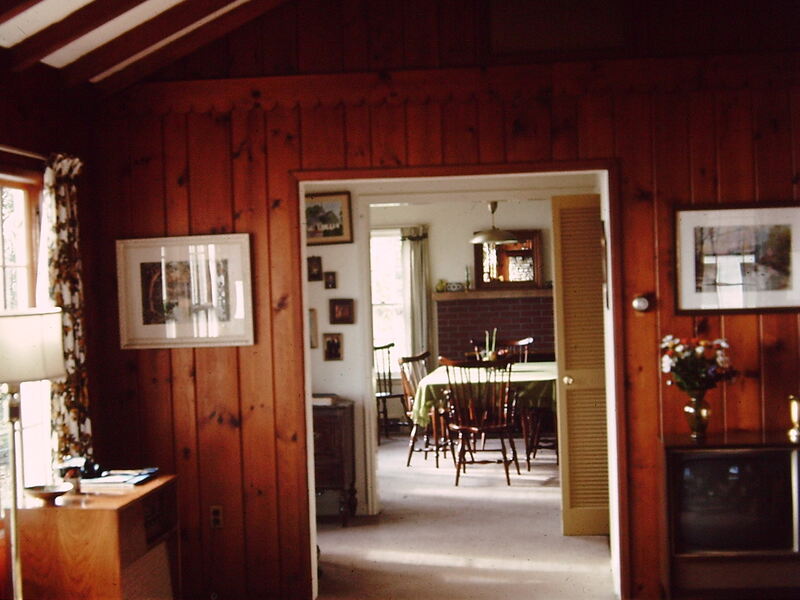 Let’s imagine you’re now in the dining room, looking back toward the living room. Dad’s seated, wearing a red flannel shirt and inspecting something. Mom, standing, gazes out the front window. There’s another person seated to Dad’s left. 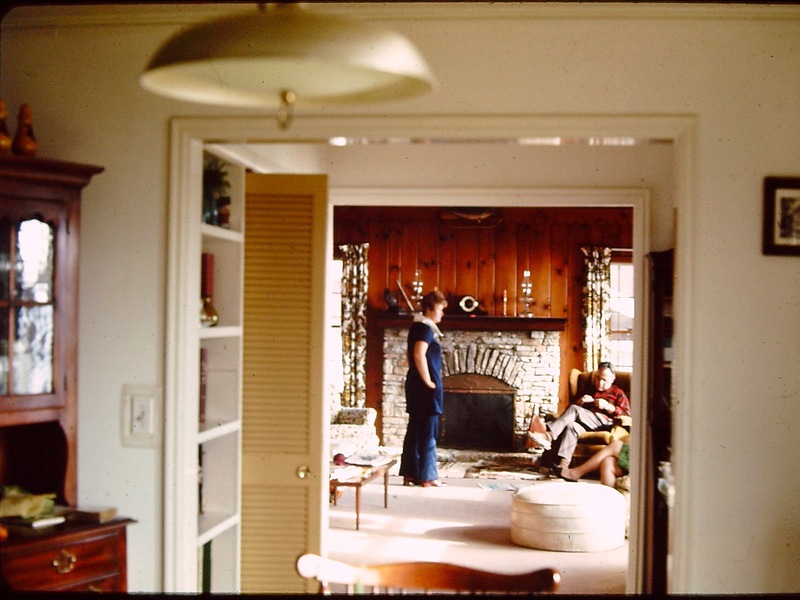 I’m haunted by this photograph—harsh light capturing these ghosts, obliterating their faces, in a living room that I’m sure looks nothing like it did that late April night in 1978. ~ by completelyinthedark on February 8, 2013.